And Who Says Flipping Houses Isn’t Glamorous? Flipping a house generates a lot of debris . . . and it all has to go somewhere. 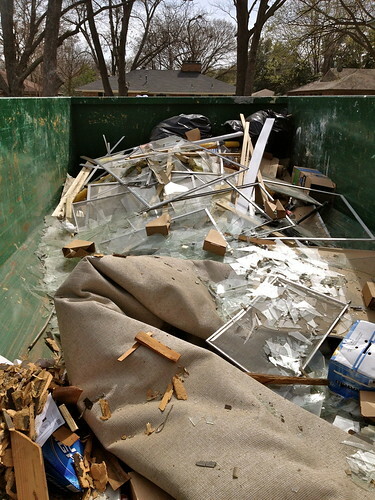 We typically just have a giant dumpster in the driveway that gets rotated out with a fresh dumpster as it gets full – easy! But last week we kissed our last dumpster goodbye – we’re near the finish line and we figured that we could handle disposing of any last-minute trash and debris on our own. So we did. And let me tell you – the city dump is not glamorous. After loading up the truck with construction debris, we drove down to south Dallas, turned on a random road and there we were. The dump. We were greeted by some lovely signs . . .
. . . and a long line of other trucks filled to the gills with junk. Once we got to the front of the line, we pulled our truck onto a big scale and I hopped out to show the guy behind the counter my driver’s license to prove that I live in Dallas County. He printed out a little receipt with the weight of our load and we were on our way! 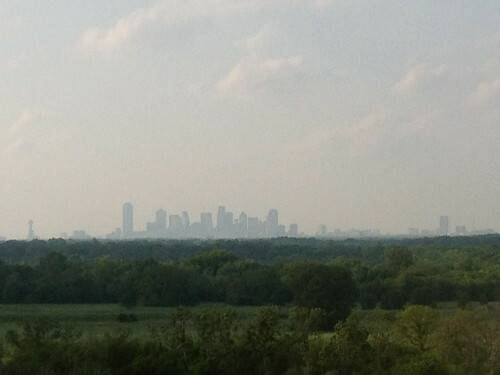 We drove up a giant hill and caught what is probably the best view of the Dallas skyline in the whole county. 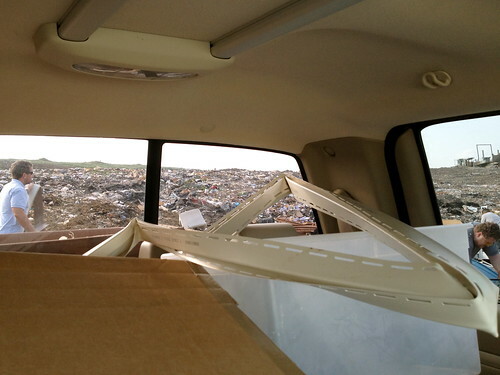 Of course that fabulous view would be at the dump! 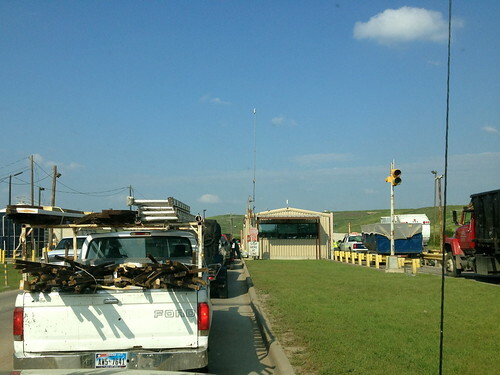 The day that we went to the dump was a day that I felt very grateful to be pregnant, because I got a “get out of jail free” card and didn’t have to load up the really heavy stuff or help Jason heave it into the giant, insanely stinky pit. :) I stayed in the truck where I only caught whiffs of the stench. You can’t quite see them in this shot, but there were flocks of seagulls circling all the trash. What about you? Have you had the pleasure of visiting the dump? Or was this post enough to keep you away for life? 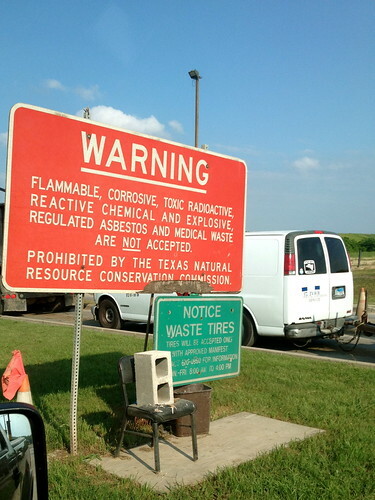 I just posted on this yesterday….our garbage company will only pick up one can of trash and one can of recycling…so we are at the dump at least twice a month. 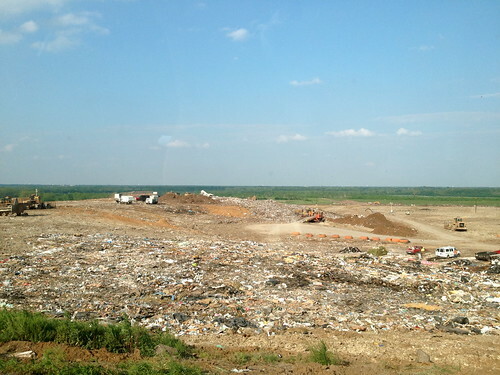 I have been to our dump, it wasn’t as bad as this one, but I live in a small city too! i haven’t ever been to a dump and i think i will stay away after this! your post makes me miss living in dallas though…seeing the skyline! Yes, I have been to dump many times with construction debris. 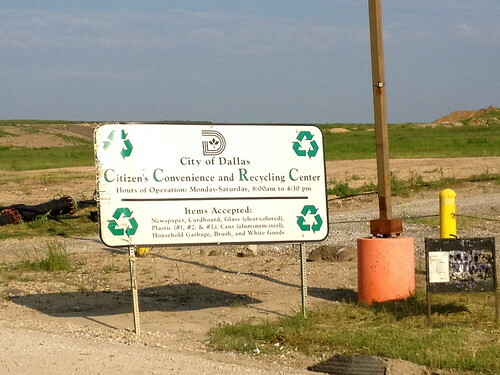 The politically correct phrases now are words like “Landfill,” and “Environmental Recycling Center.” I hate going in summer when the stench is bad, but I always feel like I’ve done a good deed when I put unwanted stuff where it’s supposed to go. My other reward is that I get to leave with some good quality mulch and compost at low cost. Ahh, yes. We used to be fixtures at the dump. Since we were weekend warriors, a dumpster was out of our budget. So, my dad has a huge dump trailer and we’d load it up every weekend and dump it on Saturday mornings. We had a city dump that was FREE for residents, so it was a steal. Our new city doesn’t have one, so we took a different approach. Anything we couldn’t fit in our trash, we put on Craigslist. (Big stuff like windows, piping, cabinets, our garage, our fence.) It worked pretty swell for us. We’re weekend warriors too, so no dumpster for us at our new house. We’ve already become well-acquainted with the local dump. 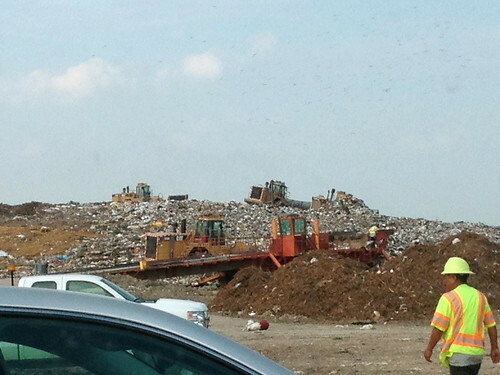 Rather than an open pit, we drive up to a huge building, pick a bay and throw the garbage in. I think it’s then trucked out. I think it used to be a regular dump, but it looks like it might be full and most of the old piles of waste have been covered over and now there’s huge hills of mowed grass. No, I haven’t been to any dump. But I am hats off to you for taking on this flipping house business. It doesn’t matter if it is glamorous or not, as long as you have the drive. The reward after the sale is worth it of course. I think summer time is best to do dumping.